Fiber is a major component of many fruits, vegetables, legumes, whole grains, nuts, and seeds—most plant-based foods. Due to its numerous benefits, fiber is also added to most processed and packaged foods. Fiber is an important product that positively affects numerous body systems and processes. Don’t feel the pressure to overhaul your diet, but rather make slow and steady substitutions with fiber-rich foods to experience health benefits discussed in this article. Big nutritional changes present greater barriers for the body to adapt to. Start slowly by adding the fiber-rich smoothie to your diet at first and work on from there, towards healthy, high fiber sustainable lifestyle. Eat whole fruits and vegetables with flesh and skin – no juicing, the fiber is in the pulp. 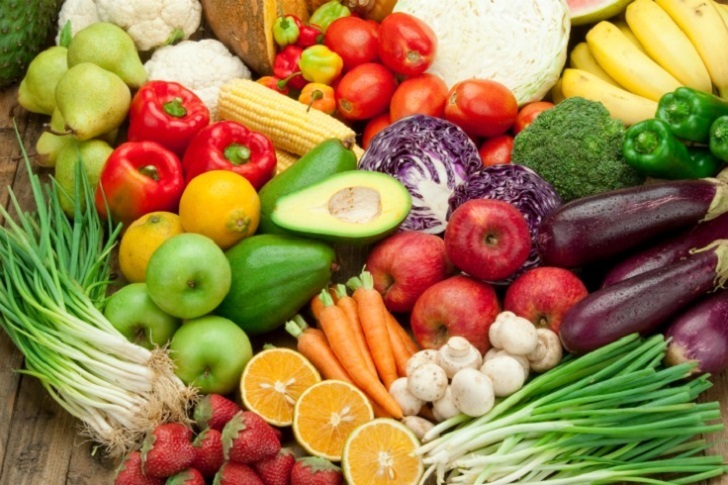 In addition to fiber, fruits and vegetables contain valuable phytochemicals to fight disease. Lentils and beans – most of the carb calories within are fibrous and are passed on to be fermented or eliminated as waste. Whole Grains – minimally processed grains – whole wheat flour, whole wheat rice, and oats. In addition to fiber, whole grains contain phenolics and carotenoids that carry a number of health benefits. Seeds and nuts – flaxseed and walnuts are a good source of fiber and essential fatty acids. Nuts and seeds pack a large number of calories and need to be eaten in moderation. Take fiber supplements with food to maximize the benefits. Breakfast – High fiber steel cut oats, topped with fruit and nuts – Breakfast Porridge. Morning Snack – Protein and Fiber-rich smoothie alternative to the usual donut and coffee pick-me-up. Lunch – Start with a chopped veggie salad or, add some carrots and celery as a side to your sandwich. Try to maximize on fiber-rich vegetables like bell peppers, carrots, radishes, broccoli; over lettuce. Afternoon Snack – Fruit and Vegetable smoothie – blend a few green vegetables (spinach, kale, broccoli) together and add some fruit (pineapple, banana) to mask some of the vegetable taste. Dinner – include more beans and lentils as a high fiber and protein alternative to meat. Metabolism is more than just calories in / calories out; it encompasses all of the biochemical and physiological reactions that take place within the body. Simply put, desired metabolic health is the body working at its optimum regenerating, repairing and building cellular components like cells, hormones, enzymes and DNA amongst many others. The cardiovascular system includes organs that allow blood to circulate and carry needed nutrients (amino acids), oxygen, fuel (glucose and triglycerides) and hormones across the body—heart, blood, and blood vessels make up this system. With poor diet and lack of physical activity, the body begins to store fat deposits within blood vessels, thus reducing the effectiveness of the system and cardiovascular health. Gut Flora increase – by fermenting inside large intestine, fiber provides food for good bacteria to grow via, resulting in the production of Short-chain fatty acids (SCFA), that have been linked to improved cardiovascular health. Gut bacteria have numerous benefits including improved immunity, production of vitamins B and K; as well as the breakdown of bile acids, steroids and xenobiotics (antibiotics and alike). Fiber also possesses some of the disease preventative benefits including reducing the risk of certain cancers, type 2 diabetes, and heart disease, however, these topics are beyond the scope of this article. Stool passage – fiber traps water and aids in the passage of waste, preventing constipation amongst other digestive health benefits. Satiety – fiber slows down digestion (food stays longer in the stomach). Furthermore, it can trap water, increasing bulk or amount of material in the GI track — improving the viscosity of a meal. Soluble fiber fermented in the large intestine releases satiety hormones like GLP-1 (Glucagon-like peptide 1) and PYY (Peptide tyrosine). Decreases metabolized energy – unusable foods (calories) are lost through stool, urine and combustible gases. As a product, fiber limits caloric absorption by diluting the diet’s energy (sugars and fats) availability, while maintaining other important nutrients. Glycemic control – fiber is indigestible, staying longer in the stomach which slows down the absorption of other carbohydrates. It changes the glycemic index of foods in a positive way by delaying the release of glucose into the bloodstream and therefore decreasing the insulin spike. Cholesterol-lowering benefits – changes physical characteristics of consumed foods through a steadier delivery of nutrients such as glucose and some lipid molecules in the plasma following a meal.